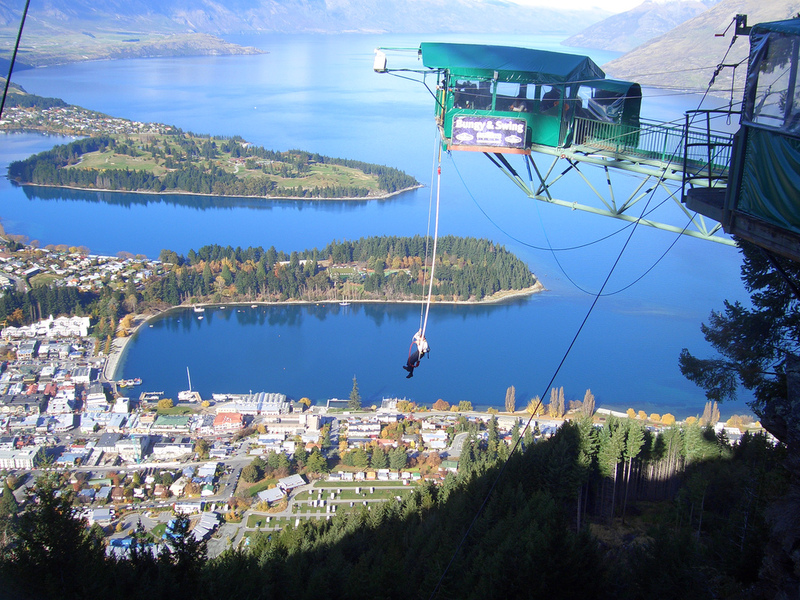 Queenstown adds its unique brand of creature comforts to amazing extreme sports, but eventually the time comes to leave the confines of the city and strike out to explore what makes New Zealand truly remarkable – the undisturbed natural environments that instantly take you centuries back in time. From snow-capped mountains and alpine glaciers to golden beaches and luscious green rainforests, New Zealand possesses them all in abundance. More importantly, these contradictory and contrasting landscapes lie so close that they seem to blend together, with mountains seemingly growing straight out of the waters and glaciers merging into rainforests. Local Kiwis certainly make the most of this, and yet the landscapes still manage to maintain a rugged appeal that is barely dampened by the appearance of a ski slope across a valley or a passing flotilla of kayakers. Of course there are still areas where you can wander for days and see no one by a lone farmer tending to his vast herds of sheep. In short, with so much to offer, and so many places to explore it isn’t hard to understand why New Zealand is such a popular tourist destination, but even here some attractions stand head and shoulders above the rest. Hidden underneath New Zealand’s North Island, the Waitomo Glowworm Caves are a magical subterranean world that could easily been lifted straight from the imagination of a science fiction writer. To reach them it is necessary to take a boat ride, floating through ancient caverns, past beautiful stalactites, before reaching the Glow-worm Grotto. It is from here that the caves are named, after the thousands of glow-worms that gather in their masses, bathing the area in an eerie light. Positioned within the Pacific Ring of Fire, an infamous area of volcanic activity, the Maori owned Hell’s Gate is one of the world’s most famous and active geothermal sites. Home to the largest hot waterfall in the Southern Hemisphere, it consists of boiling mud pools, powerful fumarolesand erupting water jets. It was believed by ancient Maoris to have healing properties, and visitors today are welcome to submerge themselves in the geothermal muds and give it a try. Even if the mythical healing properties don’t work their magic, it still provides an unrivalled spa experience for tourists. Located on New Zealand’s South Island, within the Westland National Park, the Franz Josef Glacier is one of the most accessible glaciers in the world, giving visitors the chance to try their hands at being intrepid explorers. Guided tours navigate tourists past frozen waterfalls and through ice tunnels. Formed in the ice age, the Franz Josef Glacier is rare due to its uncharacteristic behaviour of existing in a temperate environment. The icy glacier descends until very close to sea level, closer than any other glacier, before disappearing into the green density of a lush rainforest. Dubbed the 8th Wonder of the World by Rudyard Kipling, Milford Sound is one of New Zealand’s top tourist attractions. It is situated on New Zealand’s South Island within both the Fiordland National Park and the Milford Sound Marine Reserve. Formed by glaciers, Milford Sound is a fiord; a long, narrow inlet of water bordered by steep and dramatic cliffs. It is considered to be an area of outstanding natural beauty due to the contrast of the sharp, rugged cliffs that protrude from the soft, dark waters surrounding them while waterfalls cascading down in return.